That’s a new headline isn’t it? Looks like, after a couple of years of me waving off fiction, fiction is done waving off me. 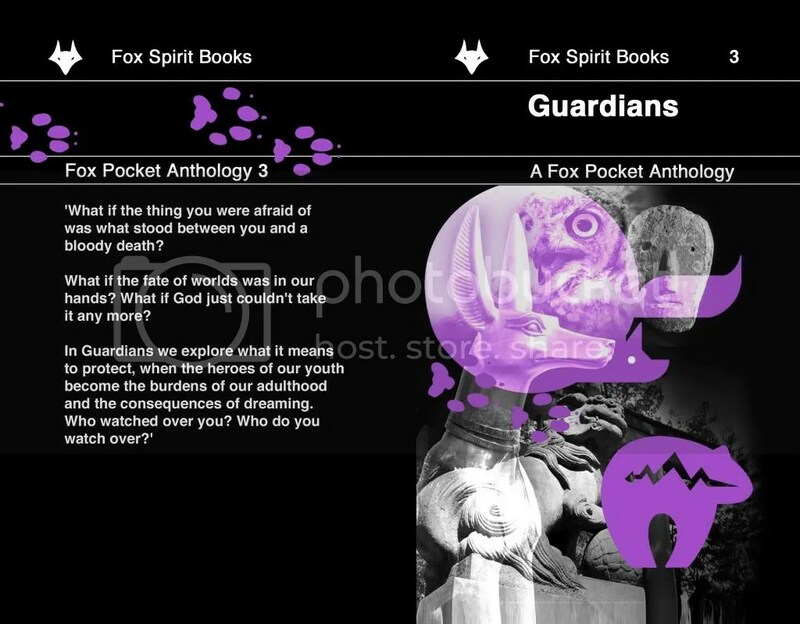 First off, I have a story in the new Fox Pockets Anthology, Guardians. ‘Fat Angels’ is a very odd little piece that’s close to my heart and went down like a freshly prepared vomit latte at my writing group the week I brought it along. It’s me playing with slightly Gaiman-esque spirituality, chip shops and my own personal connection to my beliefs. I SWEAR there are jokes in there. Seriously. Good ones. Karen, the lead, is a favorite of mine and I wrote a few other stories featuring her. I’m hopeful they’ll see the light of day soon. In the meantime Guardians, which also features Colin Sinclair, Geraldine Clark-Hellery, Jack Hanson, Chris Galvin, Paul Starkey, Alec McQuay, Jonathan Ward, Christian D’Amico, Emma Teichman, Rahne Sinclair , Margrét Helgadóttir, James Fadely, Den Patrick, Catherine Hill and Chloë Yates.It’s a great book and is available now. So, the audiobook Oscars, basically. I loved working on Thirteen because it was just one of those ideas that was fun all the way from top to bottom. 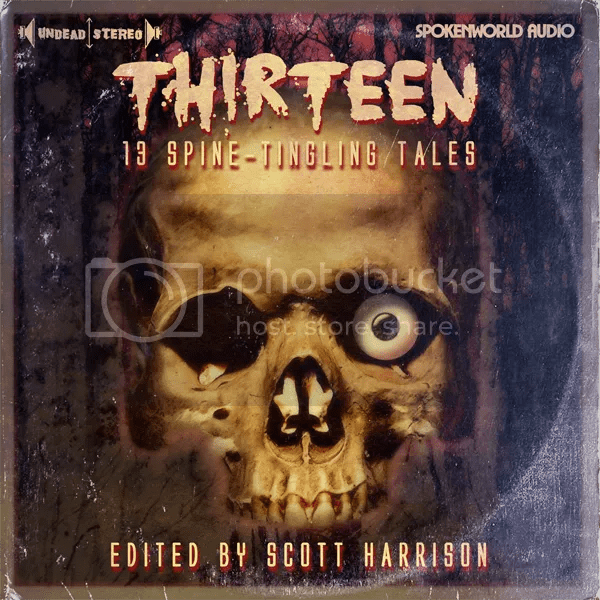 Scott Harrison‘s basic idea, of a lost vinyl LP filled with horrifying stories, was great and Scott did his usual impressive work editing everything together. Neil Gardner, one of the finest audio engineers on the planet made the whole thing sound great and Matt Dillon (Yes, this Matt Dillon) turned in a fantastically gnarly cover. Then there’s the writing and acting talent. So, a story I wrote years ago, rewrote a few years after that and had all but given up hope on has ended up here. With Stephen Gallagher and Kim Newman, two of the authors who’ve influenced me the most, as it’s neighbors and read by Lalla Ward. I have a huge case of impostor syndrome, pretty much every author I know does, and there are days where I place no worth in what I do at all. But one of the best editors, best sound producers and one of the finest actresses of her generation combined to turn my words into something extraordinary which is part of something even more extraordinary. And now it’s a finalist for a major award. That’s a pretty damn good day at the office. Of course the thing about being in the final is everyone’s really good. I mean, seriously, look at this list. But that isn’t what matters. What matters is I was part of a fantastic project with some amazing people that’s been recognized as such. Well that and the fact you can buy it over here. So that’s self promotion, a little light capitalism and not a self deprecating comment in sight! Tea and medals all round!